Christopher Frank Capuano (born August 19, 1978) is an American former professional baseball pitcher. He played in Major League Baseball (MLB) for the Arizona Diamondbacks, Milwaukee Brewers, New York Mets, Los Angeles Dodgers, Boston Red Sox, New York Yankees, and Milwaukee Brewers, and was an All Star in 2006. Capuano graduated from St. Thomas School in West Springfield, Massachusetts. Four years later, Capuano was the valedictorian of his class at Cathedral High School in Springfield, Massachusetts and went on to earn a degree in Economics at Duke University, where he earned membership in Phi Beta Kappa. He was also a brother of the Xi Chapter of Alpha Tau Omega fraternity. Capuano was drafted by the Arizona Diamondbacks in the 8th round of the 1999 amateur draft (238th overall). He played with South Bend Silver Hawks of the Class A Midwest League in 2000 and the El Paso Diablos of the Class AA Texas League in 2001. He began 2002 with the Tucson Sidewinders of the Class AAA Pacific Coast League (PCL) and was 4–1 with a 2.72 ERA when, on May 17, he had Tommy John surgery and missed the rest of the season. He made his MLB debut with the Diamondbacks on May 4, 2003 against the Atlanta Braves, picking up the loss in a two-inning appearance in extra innings. He made his first start on May 17 against the Pittsburgh Pirates, but only lasted 4 and ​2⁄3 innings while allowing seven earned runs to take the loss. He was optioned back to the minors after that start and called back up for a spot start on July 9 against the San Diego Padres, where he worked seven innings, allowed only one unearned run and picked up his first victory. He returned to the minors after the appearance, where he made 23 starts for Tucson, with a 9–5 record and 3.34 ERA, earning him PCL All-Star honors. He returned to the Diamondbacks when rosters expanded in September and overall appeared in 9 games for them, with 5 starts, and was 2–4 with a 4.64 ERA. Capuano pitching for the Milwaukee Brewers in 2006. On December 1, 2003, Capuano was traded to the Milwaukee Brewers (along with Craig Counsell, Lyle Overbay, Junior Spivey, Jorge de la Rosa and Chad Moeller) for Shane Nance, Richie Sexson and minor leaguer Noochie Varner. He made 17 starts for the Brewers in 2004 and was 6–8 with a 4.99 ERA. His 2005 season with the Brewers proved to be a break-out year as he posted 18 wins, the highest total for a Brewer since Ted Higuera in 1987. He also led the National League in quality starts during the 2005 season. In 2006, Capuano continued his excellent pitching by taking over as the team's new ace with Ben Sheets injured and was named to the 2006 Major League Baseball All-Star Game as a replacement for Tom Glavine. Capuano, however, ended up with only 11 wins in 2006. Capuano started the 2007 season 5–0 and then the Milwaukee Brewers lost the next 22 games Capuano pitched in from May 12 to September 28. In June he hit his first major league home run against the Florida Marlins. Before the start of the 2008 season, he underwent Tommy John surgery for the second time in his career and missed the entire season. The Brewers non-tendered Capuano following the 2008 season, making him a free agent but re-signed him to a minor league deal shortly after. Before the start of the 2009 season Capuano had hoped to start live game pitching in mid May, but was limited to a handful of games in the Brewers rookie leagues. After becoming a free agent at the end of the season, Capuano was re-signed to a minor league contract with the Brewers on November 23, 2009. Capuano was invited to the Milwaukee Brewers' spring training for the 2010 season, but early on he complained of arm soreness and was placed in extended spring training. He would start the regular season with the Single A, Brevard County Manatees of the Florida State League. Capuano would only need 3 appearances with the Manatees before being promoted to the Triple A Nashville Sounds. In those 3 appearances, Capuano registered a 2–0 record with a 1.23 ERA and 17 strikeouts in 14​2⁄3 innings pitched. On May 28, 2010, Capuano made his final start for the Sounds, and was pulled after four innings. After the game, it was announced the Brewers had purchased his minor league contract and he was recalled to the majors. Capuano started the Brewers' June 3, 2010 game against the Florida Marlins in Miami, giving up three runs on seven hits in 3​2⁄3 innings while striking out four and walking one. He was charged with the loss in the 3–2 Marlins win. On July 3, 2010, he appeared in a Brewers victory against the St. Louis Cardinals in St. Louis. This snapped the streak of 26 straight losses he had appeared in between 2007 and 2010. Capuano pitching for the New York Mets in 2011. Capuano signed with the New York Mets before the 2011 season. On August 26, pitching against the Atlanta Braves, he threw his first complete game shutout since 2005, setting a career high in strikeouts in a game with 13. He made 31 starts for the Mets in 2011, his most since 2006, and also appeared in relief twice. He was 11–12 with a 4.55 ERA during the season. 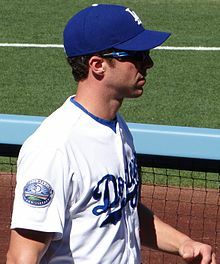 On December 2, 2011, Capuano signed a two-year deal worth $10 million with the Los Angeles Dodgers. He started the 2012 season strong, with a 9–4 record and 2.91 in his first 18 starts but went only 3–8 with a 4.76 in his last 15 starts. Overall, he was 12–12 with a 3.72 in 33 starts. Capuano began the 2013 season in the bullpen due to the Dodgers having too many starting pitchers. He got a chance to start on April 16 due to an injury to Zack Greinke but suffered his own injury, a strained left calf, in the game and only lasted three innings. He wound up making 20 starts for the team in 2013, despite missing time with various injuries. He also appeared in 4 games out of the bullpen. His final record was 4–7 with a 4.26 ERA. On February 20, 2014, Capuano reportedly agreed to a $2.25 million one-year contract with the Boston Red Sox. He passed his physical and the deal was made official on February 22, 2014. Capuano began the 2014 season with 15 consecutive scoreless innings. From May 3, 2014 through June 23, 2014, he allowed 17 runs over 16 2/3 innings. On June 25, 2014, he was designated for assignment. He was released on July 1. Shortly after his release from the Red Sox, he signed a minor league deal with the Colorado Rockies. He pitched for the Tulsa Drillers of the Texas League and the Colorado Springs Sky Sox of the PCL, making a total of four starts between the two teams. On July 24, 2014. Capuano was traded to the New York Yankees from the Rockies for cash considerations. In 12 starts for the Yankees, Capuano went 2-3 with a 4.25 ERA. Despite being a free agent, Capuano pitched for the MLB All Star team in the 2014 MLB Japan All Star Series. Wearing a Yankee uniform, he started two games for the MLB All Stars, allowing just one earned run on five hits and striking out seven batters. On December 16, 2014, Capuano re-signed with the Yankees on a one-year, $5 million contract. He was designated for assignment on July 29, 2015. He was called back up by the Yankees on August 12 and designated for assignment again three days later. The Yankees then recalled him again on August 18 to take the place of Bryan Mitchell, who had been injured by a line drive during a spot start the previous evening. After being designated for assignment once again on August 22, he elected free agency on August 24. However, due to an injury to CC Sabathia, Capuano immediately re-signed with the Yankees. He was designated for assignment yet again the following day when Michael Pineda was activated from the DL. He was called up again on September 7. Capuano signed a minor league deal with the Milwaukee Brewers in January 2016, and went on to make the big league club out of spring training. He pitched well out of the bullpen for the Brewers for the first two months of the season until he sustained an elbow injury while pitching in a game versus the Atlanta Braves. On March 6, 2018, Capuano retired from professional baseball. Capuano played on Team USA in the 2001 World Cup of Baseball and helped the team earn a silver medal. Chris also represented the Major League All Stars Versus the Japanese All Stars in several exhibition games in Japan in November of both 2006 and 2014. Capuano was a finesse pitcher who relied on his deceptive delivery. He threw his fastball in the mid to upper 80s, and would sometimes hit 90 mph in the early stages of a game. Capuano also featured a slider and a changeup, and possessed an excellent pickoff move. In 2005, he led the major leagues in pickoffs with 12, though he also tied Brett Myers for balks with 4. Capuano, along with teammates J. J. Hardy, Bill Hall, and Jeff Suppan, appeared in an episode of The Young and the Restless on June 20, 2007. He married Sarah Clifford, whom he met at Duke, in 2008. The two divorced in 2018. She was a contender for the 2004 Summer Olympics in Athens, for the modern pentathlon. Capuano grew up a Red Sox fan. After his playing career, Chris furthered his education with an MIT Sloan Fellows MBA (Class of 2019); has remained a close advisor of the Major League Baseball Players Association; and is a Strategy and Development Partner for Boston Biomotion, Inc., focusing initially on its flagship health technology called Proteus. ^ Edes, Gordon (February 23, 2014). "Capuano shaping up as smart move". ESPN.com. Retrieved June 26, 2014. ^ Waldstein, David (January 7, 2011). "Mets Try to Be Brainy With Pitching Staff". New York Times. Retrieved June 26, 2014. ^ Ang, Kelvin (June 5, 2007). "Players choose different paths to Majors". MLB.com. Archived from the original on March 4, 2016. Retrieved June 26, 2014. ^ Andrew Beaton (June 30, 2011). "Baseball is all business for Chris Capuano". Duke Chronicle. Retrieved February 20, 2014. ^ a b c d e f g h "Chris Capuano Statistics and history". Baseball Reference. ^ "Reports: Brewers' Capuano headed for second Tommy John surgery". ESPN.com. May 13, 2008. ^ "Brewers do not tender offer to Capuano". Milwaukee Brewers. Archived from the original on February 1, 2014. Retrieved January 25, 2016. ^ "Tom Haudricourt – Peterson has healthy outlook on building pitching staff". Archived from the original on February 1, 2016. Retrieved January 25, 2016. ^ "New York Mets sign Chris Capuano, Taylor Buchholz; assign Igarashi". ESPN. January 3, 2011. Retrieved August 27, 2013. ^ Simon, Andrew (April 17, 2013). "Dodgers place Capuano on DL, recall Federowicz". MLB.com. ^ Tim Britton (February 20, 2014). "Report: Red Sox sign left-hander Chris Capuano". Providence Journal. ^ Speier, Alex (June 25, 2014). "Red Sox Designate Chris Capuano For Assignment to Clear Roster Space for Clay Buchholz". Mlb.mlb.com. Retrieved June 25, 2014. ^ "Red Sox drop Capuano to add Buchholz". ESPN.com. Associated Press. June 25, 2014. Retrieved June 26, 2014. ^ Mastrodonato, Jason (July 1, 2014). "Boston Red Sox release Chris Capuano, trade Rich Hill to Los Angeles Angels". The Republican. ^ "West Springfield's Chris Capuano signs with Colorado Rockies". masslive.com. Retrieved December 16, 2014. ^ "Yankees add to pitching inventory with Chris Capuano". New York Post. Retrieved December 16, 2014. ^ "Yankees acquire LHP Capuano from Rockies for cash". ESPN.com. Associated Press. July 24, 2014. Retrieved July 25, 2014. ^ "Pitching-deficient Yankees re-sign Chris Capuano". New York Post. Retrieved December 16, 2014. ^ "Chris Capuano goes on DL with left-elbow soreness". Retrieved May 31, 2018. ^ Brown, Garry (January 24, 2018). "Chris Capuano's 12-year major league baseball career a study in tenacity". masslive.com. Retrieved March 6, 2018. ^ "Press Releases". Major League Baseball. Retrieved May 31, 2018. ^ "Four Brewers stars make acting debuts on soap opera". ESPN.com. Retrieved January 25, 2016. ^ CURT SYNNESS Independent Record. "Return to the mound". Helena Independent Record. Retrieved January 25, 2016. ^ "Pitcher Chris Capuano of West Springfield signs with Red Sox". masslive.com. Retrieved December 16, 2014. Wikimedia Commons has media related to Chris Capuano. This page was last edited on 10 April 2019, at 18:30 (UTC).